So we did this thing. I mean, you probably haven't heard of it. 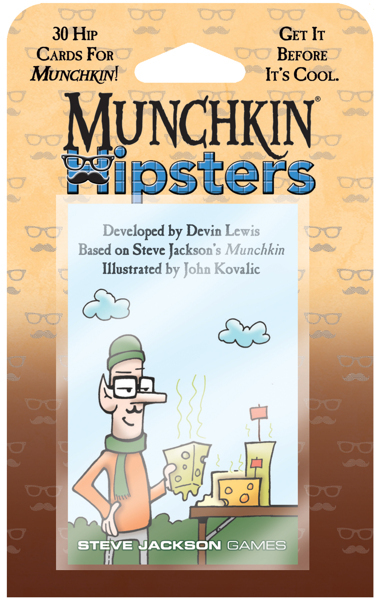 It's called Munchkin Hipsters. Anyway, we're selling it through this little boutique online store called ThinkGeek. It's a double-sized booster, 30 cards, if you're into that sort of thing. Maybe play it while you're listening to some obscure LP. Drink a double venti mocha-frappa-latte or something. P.S. 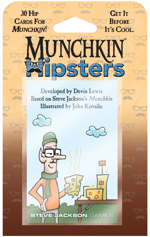 The link will take you to ThinkGeek's website, where you can purchase either the core set or the Munchkin Hipsters booster. Click the little checkbox in the listing if you want the booster!